For the past hour I've been looking at the above image as I prepare it for publication. The source material comes from a beautiful 5 year run of Rusty Riley dailies provided by Dennis Wilcutt. 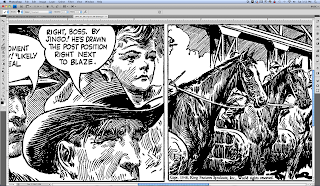 All strips were scanned at 1200 DPI which some of you out there may think of as a bit extreme, considering when they print they are down-sampled to 600 DPI but I like working with the best image possible, and 1200 DPI seems to work very well with the source material I'm dealing with, at least when it comes to black and white images. Color is a whole different ball of wax. 1200 is big, but if it wors for you and give us good stuu, who want to argue? Keep up the good work. 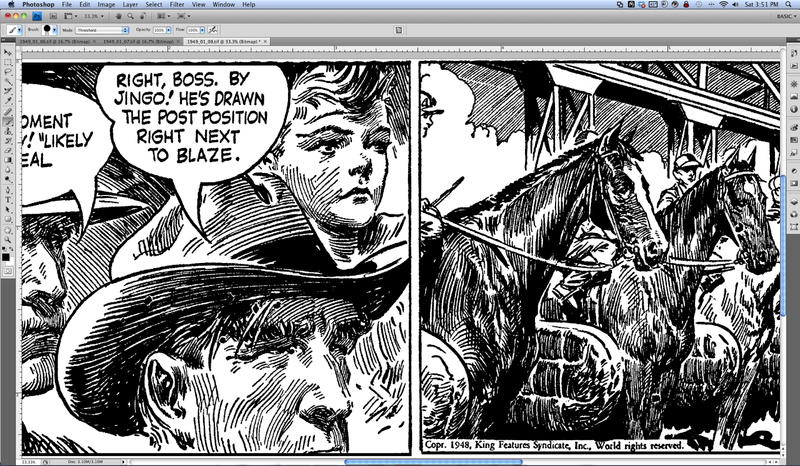 Mr. Pelto good work Ive got the Ken Pierce volumes and would like to compare what is the exact date of this strip sample?